A trip to a foreign country is a luxury and privilege that not many achieve during his or her lifetime. This is one of the most common questions one is curious to know through astrology after marriage and wealth. Today people are interested to go abroad for pursuing higher education, business opportunities, holiday and also for a job. We will read below some of the important combinations related to foreign trips in ones horoscope. There are many houses connected with journey like the 3rd house, 9th house and 12th house. 3rd house is the house for small journeys. 9th house is the house of distant travel. 12th house is the house of foreign settlement. A strong 9th house indicates that the native will travel to far away land. If there is sign Sagittarius or Pisces which are the signs belonging to Jupiter and the Jupiter Dasha is going on then the native will frequently go on a pilgrimage. If there is a connect with 9th house and 12th house it indicates that the person will go overseas for a spiritual journey, like those visiting Haj Yatra and visiting Kailash Manasarovar. If there is sign Gemini or Virgo then the native will go to a distant place for education. Mercury is the planet for education, intelligence and knowledge. Mercury linked with the 9th house indicates the native will travel to a distant place for education. A strong link between the 9th house and the 12th house indicates permanent or temporary stay abroad. This stay can be students pursuing higher education in foreign universities. Presence of the malefic planet in the 4th house indicates a foreign settlement. 4th house signifies homeland and malefic present or aspecting the 4th house and the 4th lord indicates settlement away from home. Link between the lagnesh and the 12th house indicates the natives inclination to settle overseas. Malefic in 4th house and connection between the 1st and 12th indicate the natives desire to stay away from his country of birth. Movable sign in lagan or the house where lagan lord occupies indicates the person strong desire to move away from one place to another place. Such native will not be stationary at one place and would always be on the move. Further Rahu posited in 4th house or aspect on Lagna only makes this condition much stronger in the native chart. One thing to remember is that the presence of a dual-natured sign (Gemini, Virgo, Sagittarius and Pisces) or a movable sign (Cancer, Libra, Capricorn) in the 9th house enhances probability of foreign travels as compared to fixed signs. The lord of the 10th house connected with the 12th house indicate the native going overseas for business/ job/ project. The probability of stay overseas depends upon the sign and the strength of the significators involved. Rahu connected with 4th, 9th , 10th& 12th also indicates foreign journey. If the lord of the house of marriage or the 7th house is associated with 9th or 12th house, it indicates foreign travel after marriage; the native may go for honeymoon in a foreign country. If the lord of 10th house and the lord of 4th house are present in the 12th, it indicates a trip for career or professional advancement. If the 12th lord is in the 4th or the 5th house the native has a strong change of overseas education. Should the 12th lord be posted in the 9th house , the native will take many foreign trips. Ascendant lord in 12th house with aspect from Saturn denotes difficult in foreign country. The native will go abroad but have problems in settlement. If Jupiter is posited in the 12th house the native will go overseas and save lot of money. If however the 12th lord is in the 11th house the native visit may prove futile, as native will spend all money he/she tries to save. If the lord of 6th house is present in travel related Yogas, the person will travel to foreign country on official assignments assigned by his employer. Involvement of Sun in Yogas related to foreign travels indicates journeys towards eastern direction and since Sun is the head of solar system and of huge size it also represents long distance travel. Involvement of Saturn in the Yogas related to foreign travels indicates a trip towards western direction and since it is far away from Sun, it indicates long-distance travel. 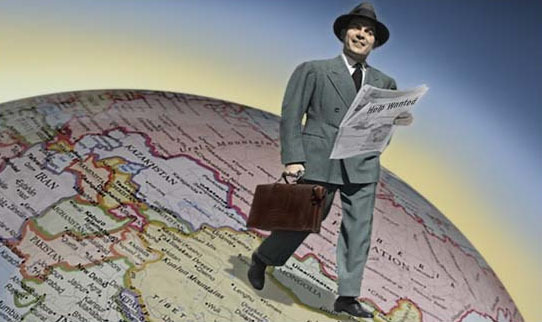 Do I have any possibility of traveling to overseas for foreign settlement or for few years? If yes, what is the likely period? I am looking for H1B i.e US work permit visa.Last time I hav applied for visa,But unfortunately my file is not picked.This year again i am applying for H1B for the year 2015.Lottery will be done in the month of april 2015.Please suggest me whether as per my astrology do i have a chances to move USA or will i get visa?If i get visa will that be a successful migration to usa & I will get a good settlement/future?Looking forward for your reply. Do i have chancea of foreign settlement. Though i have travelled to many countries but looking for foreign settlement in some western counties. Currently I am residing in India. can you please tell me about my chances of going abroad. Can you please tell me whether is there any chance currently for me to work and settle in abroad and if yes, till when i can stay abroad? Yes your horoscope does support foreign travel and work, however it is not good for settlement. Are you facing any issues in marriage. ?????? Please use the astrology forum for Questions. For the last 4-5 years i tried for overseas job but never get succeeded, So plzz.. tell me in which year and month my foreign travel happened..
Sir, I am trying to go abroad for study , Do i have foreign travel and settelment .Please let me know. Please tell me do I have any to go to USA and settle down there? I want to go abroad for my studies. Can i have any possibility of getting visa.